This friendship can be very smooth if both understand and accept the kind of roles they each need to play for things to work out. When it comes to the friendship between the Aries and the Capricorn, the first may sometimes wonder how he or she ended up being friends with such a person, who seems to be so different. While the Capricorn will try and convince the Aries to do things more efficiently, the Aries will become very nervous, but not unappreciative for all the help his or her friend is trying to offer. As a matter of fact, the Goat is very good at offering support and motivation. In return, the Aries can help his or her friend have a more exciting life and get stimulated because the Capricorn really needs all this. It can be said the friendship between an Aries and a Capricorn is strange because the first always looks towards the future, while the second prefers to analyze the past. Both of them are great leaders and love to work hard for what they’re doing to have great value. For example, the Aries can convince anyone of anything and is able to launch great businesses, while the Capricorn can take good care of finances. When working together, these two can make great things happen, but only if they’re focusing on something that’s challenging for both of them. Astrology says these two signs are intertwined, but their natives are not realizing this because their characters are very different. For example, the Aries is a risk taker who moves very fast and always wants to be first, even if he or she doesn’t stick to a project for too long. On the other hand, the Capricorn moves much slower and doesn’t want to risk anything because perseverance and calmness are the key to his or her success. While they’re both getting to the destinations they desire, they have different ways of reaching there, which means they may need to work hard for their friendship to work. The Aries is flamboyant and likes to impress, the Capricorn is pretty much reserved and responsible. Neither of them wants to give up on their ways and they’re both approaching life in opposite manners. The Aries doesn’t mind doing everything fast and dangerously, the Capricorn prefers to be slower and to keep things safe. Such differences can make their friendship tremble, especially in the beginning. However, the more these two will start to appreciate one another’s ways of thinking and realizations, the more they’ll realize they can do great things together rather than separately. The Aries pays attention to money, but also doesn’t mind spending on fun things. Generous and not in any way cheap, a person in this sign will never hesitate to help his or her loved ones with finances and anything else they may need. However, the Aries is not very good at receiving gifts because he or she prefers to just give. This native will never say “no” to someone he or she loves when it comes to money, but can be very tricky when having to buy something that isn’t related to fun for him or herself. In conclusion, Arieses prefer to only buy the essentials when it comes to their everyday living. It can be difficult to make a Capricorn trust someone, especially since people in this sign display a very distant exterior and are quite reserved. However, as soon as they have found a person they can trust, they become loving, highly devoted and giving. As a matter of fact, the Capricorn can seem a very different person as soon as he or she has forged a friendship with another native of any sign. People in this sign are very loyal, sincere and in the same time open to give a helping hand, regardless of the situation. If the Cancer is the symbol of the mother in the zodiac, the Capricorn is the one of the father. Therefore, a Capricorn will always act more as a parent than as a friend, being very protective and much more mature than his or her age should reveal him or her to be. It’s possible for a Goat to seem like a know-it-all and condescending, but his or her intentions are always good. It’s true Capricorns can’t really judge characters too well and can often get fooled, but in this situation, they turn into very mean characters. When someone is trying to betray them, they start to become suspicious of every person in their circle of friends, so they can test their loved ones to the bone. Both the Aries and Capricorn love to compete, which means when good friends, they won’t mind engaging in different activities that require them to race one another. They will even look for all kind of ways for them to be in competition. All this can trigger some tensions or very funny situations for them to laugh at. Both hate being lazy, so expect the projects they’re working on together to be done on time. While not in any way attracted to drama, it’s possible for them to have it in their friendship because the Aries simply loves when things are happening, regardless of how dramatic the situation is turning out to be. The Capricorn is usually the peacemaker because he or she wants to only reap the rewards of efforts rather than to make the situation noisy and noticeable. The Aries will always admire how the Capricorn manages to calm things down in difficult situations. The fact that these two don’t have the same values may be a problem for their friendship, especially if they don’t decide to accept one another the way they are, case in which things between them can become very fun. When having to deal with someone inexperienced can be a real problem until that person proves that he or she is very intelligent, open to learn and determined to succeed. In the same way, the Capricorn and the Aries can surprise one another with some of their positive traits, so it’s possible for them to at some point realize they’re very good together and that they even have the same things, which means their friendship only needs to be defined. It’s true they’re not capable of doing things the same way, but this isn’t a major problem when it comes for them to enrich one another’s lives. Regardless of what they may be doing, from opening a business together to visiting many exotic countries, they’ll always understand each other and agree their natures are different, yet efficient when combined. The Aries loves being in the center of attention, while the Capricorn doesn’t mind working from the shadows and doing things for their friendship to last forever. Neither of them is known to hold grudges, which means they’ll immediately make up after an argument. Some Capricorns make influential friends just to advance in their career. Their sense of humor is often not well received because they can be pretty cynical. However, since the Aries is very open to any kind of challenge and doesn’t mind dealing with different characters, him or her and the Capricorn will get along very well. Furthermore, the Aries is childish and uses his or her intelligence in order to gain many advantages. The jokes of a person in this sign can really be understood by a Capricorn, which means the friendship between these two won’t have any problems when it comes to enjoying one another. The Aries is ruled by Mars, while the Capricorn by Saturn. 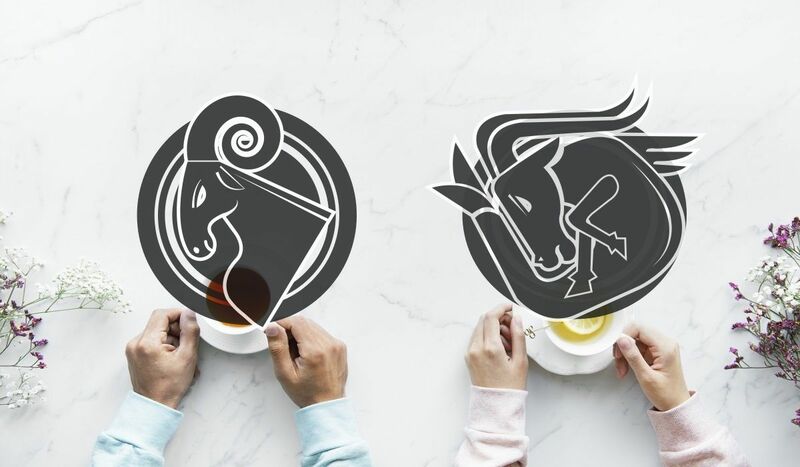 Because these planets are often in opposition, the friendship between the Aries and the Capricorn can be very much influenced by the differences in these two’s characters. Mars can help anyone overcome obstacles with an immense energy, while Saturn is known for bringing about perseverance and the ability to deal with difficult times. Therefore, the Capricorn and the Aries friends are both strong, but in very different ways. Neither of them wants to ever give up, but they should be careful with how they’re channeling their energies when friends, because they can also attract a lot of negativity upon themselves. Furthermore, they may repress their emotions and even become cold with one another if they’re disagreeing too much. The Capricorn should never slow the Aries down, while the other way around, the Aries should never hurry the Goat. The Aries is Fire, the Goat is Earth, which means the first is more passionate and energetic, while the other is down-to-earth. The Ram prefers to just throw him or herself into a situation, the Capricorn always plans things ahead and thinks of the outcome of any situation. If these two will decide to combine their strategies, their friendship will end up being very successful. As both are cardinal signs, they know how to initiate things, even if they have different ways of finishing them. The more they’ll accept each has an important role in their friendship, the smoother their connection will become. On the outside, the Aries may seem a great leader because he or she always rushes to find solutions to problems and to be first. The Capricorn has his or her ways of being in charge, so the fact that this person is reserved doesn’t mean he or she can’t get things done. If these two will decide to play their specific roles in their friendship, they can accomplish many things when working together as both have impressive qualities to bring about for this union of minds. It’s important that they allow one another to be individualistic because this is the only way for them to benefit from their specific positive traits.